Did you know that roughly 80% of all criminal activity at shopping centers, strip malls and business offices occur in the parking lot? Woah! As a business owner, you owe it to your customers to do everything in your power to ensure their safety. Plus, if you don’t, you could be found liable in a court of law based on a lack of sufficient security or not taking “reasonable care” in the protection of your employees and customers. The best way to eliminate problems with crime around your retail establishment is with parking lot security lighting, which is used to not only deter criminal activity, but also aid additional security efforts, such as surveillance cameras and security guards. Cameras and guards must be able to easily survey the parking lot, looking for suspicious activity. This is obviously much tougher, if not impossible, to do in the dark. The goal of parking lot security lighting is to provide proper illumination for security guards and surveillance cameras to do their jobs, deter criminal activity, and provide visibility for customers and employees to increase safety. Don’t give criminals a place to hide. Illuminate your parking lot and give your employees and customers the peace of mind they deserve. 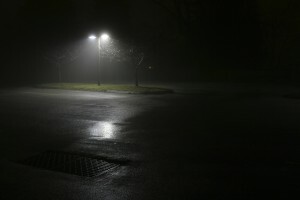 TriStar Electric has installed thousands of parking lot security lighting systems throughout Maryland and the surrounding area. We offer an array of high-quality solutions, all of which are designed to withstand the elements. Successful parking lot security lighting can be achieved with a variety of lighting sources – from LED to halogens to fluorescents. If you currently have a parking lot security lighting system that needs to be upgraded, or replaced, TriStar Electric can take care of that as well. Each parking lot presents its own particular problems based on physical layout, terrain, atmospheric conditions, and security requirements. At TriStar Electric, we are equipped with the latest tools and machinery so we are able to handle the demands of a typical parking lot security lighting installation. Whether your project requires lights to be placed on top of poles, in garages, or at varying intervals along your establishment, it is no problem. If you have any questions about Parking Lot Security Lighting, please contact TriStar Electric, Maryland’s premier residential and commercial electrician, by calling 410-799-5791 or 301-384-8880 or fill out the contact form on our website. Our electricians can provide you with a competitive quote that covers every stage of the process – from installation to final testing. This entry was posted on Thursday, January 16th, 2014 at 6:31 pm. Both comments and pings are currently closed.